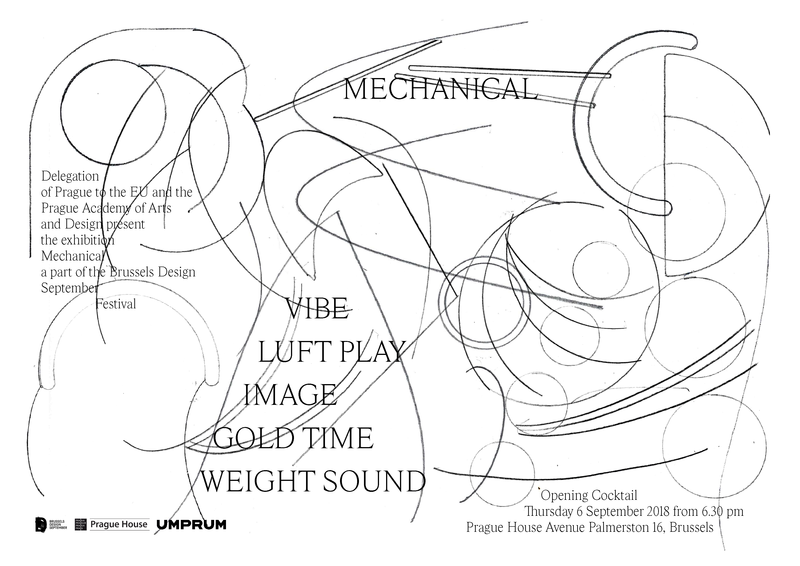 Exhibition of students and fresh graduates from the UMPRUM Studio of Product Design at Design September in Brussels. The Delegation of Prague to EU invites you to the new exhibition Mechanical which is a part of Brussels festival Design September 2018. The opening cocktail will take place on Thursday 6 September 2018 from 6:30 pm at the Prague House, Avenue Palmerston 16, Brussels. Please confirm your participation at praguehouse@praha.eu -without confirmation by the Prague House, your reservation is only tentative. The exhibition will be on display until 30 September 2018 in the Prague House in Brussels. The Studio of Product Design of the Academy of Arts, Architecture & Design in Prague will for the seventh time present at Design September in Brussels. This time they have prepared a playful installation full of machines and traditionally manufactured mechanical devices. In this current era of expanding computer proficiency and programs, students are getting better tools and opportunities that open up new creative spaces. However, it is understandable that the focus on virtual reality often means a loss of craft and dexterity but above all, the loss of contact with the production environment. “By returning to analog technology, drawing, sketching and modeling in different types of workshops, we wanted to encourage students’ to have a sensitivity to materials and an understanding of historical contexts. Our presentation focuses on the mechanical propulsion of various products and art objects”, explains Jan Neměček one of the leading professors in the department. The students of the Studio of Product Design of the Academy of Arts, Architecture & Design in Prague took on the assignment with great enthusiasm and creativity. They created clocks, gramophones, toys, and moving sculptures that use the “insides” of old alarm clocks, sewing machines, and mechanical wind-up toys. “We believe in playfulness but also the brutal aesthetics of machines that can help us expand our virtual horizons. For this exhibition, we also focused on collaborating with manufacturers, for example, the legendary and world-renowned Hi-Fi technology of SEV Litovel was used to create the students’ Bachelor’s degree program gramophones. Petr Vykoukal and Matěj Coufal got the interest of an Austrian distributor, Pro-Ject Audio systems, which has been a long-standing partner of the SEV Litovel turntable company “, says Michal Froněk the second leading professor. Johana Němečková’s diploma project of outdoor seatting furniture for the company Meyto presented at this year’s Design September is another project that used an analogue production process. Her style, the technology used, and the muted palette, already gained attention while it was presented during the summer at the UMPRUM school exhibition. Dominik Novák from the first year created a ready-made object from an old mechanical gramophone that functions with the help of a handle. His race car track returns us a few decades back to a time when children played in the “real” world. Last but certainly not least, visitors can get a”taste” the design of Jakub Jarcovják, who designed a portable grill for Ambiente, it is inspired by traditional open fire cooking. Once again in a nutshell! Mechanical. The Mechanical Exhibition will take place with the support of the Prague City Hall, the Prague House in Brussels and the Academy of Arts, Architecture, and Design in Prague within the framework of the Brussels Design September Festival. Since 1999, the Product Design Studio has been led by former UMPRUM graduates Michal Froněk and Jan Němeček, both of the Olgoj Chorchoj Studio. The ethos of the studio is based on teamwork. Students are taught to create and explore through open dialogue and mutual collaboration while preserving the independence and individuality of each contribution. This process of learning is inextricably linked to practice, which is also developed through partnering with producers and manufacturers. In order to be prepared for the competitiveness of “the real world”, students are encouraged to mine their own talent, creativity, intelligence and knowledge through hard work and an awareness of what it takes to succeed as a professional while remaining faithful to their own creative roots. Graduates of the studio include Jan Čtvrtník, Jan Čapek, Vladimír Žák, Roman Vrtiška, Filip Streit, Jan Tuček, Dominika Applová, Veronika Loušová, Lucie Koldová, Anna Hanzalová-Kozová, Petr Mikošek, Adam Tureček and Daniel González. The Academy of Arts, Architecture & Design in Prague was founded in 1885. Throughout its existence it has ranked among the best educational institutions in the country. It boasts a number of successful graduates who have gone on to become respected professionals, garnering acclaim beyond the Czech Republic. The school is divided into the departments of architecture, design, fine arts, applied arts, graphic and theory and history of art. Each department is divided into studios according to their specialist area. The studios are all led by leading figures of the Czech art scene. Twice a year the school opens to the public for a presentation of student work, entitled “Artsemestr”. Each year the school organises over 15 exhibitions, half of which are shown abroad. Prague UMPRUM is the only Eastern European school that figures in the indices of prestigious European and world art schools. The Brussels Design September Festival is the largest design show in Belgium. Every year, for a month the City of Brussels hosts dozens of cultural and commercial events, it is an opportunity for Belgian and international designers to meet, and where both experts and the general public converge. This year’s 13th annual festival aims to present the latest trends in Belgian and international design with an emphasis on the multidisciplinary style of various influences, crafts, and professions. Design in a variety of forms takes an increasingly important place in the everyday life of the city of Brussels: urban furniture, installation, lighting, and designer innovations in the urban landscape. The festival contributes positively to the prestige of the city and its economic and tourist activities. Representation of the Capital City of Prague to the European Union was opened in 2002. Its key mission is to continuously ensure awareness of Prague and its interests among representatives of European institutions and other relevant organizations. Important areas of the Prague House are the European fund and the European Committee of the Regions’ agenda, as well as the organization of cultural activities which significantly contribute to the acquisition and consolidation of important links to EU institutions and serve to present the capital city of Prague.